Whimsical world globe. There's changing your outlook, and then there's seeing the world in a whole new way. 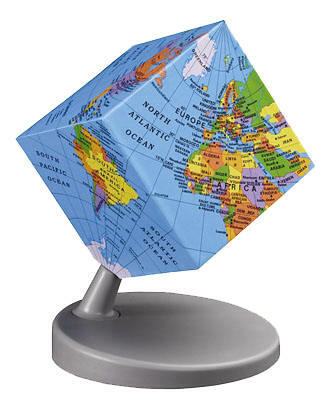 The Earth² globe is a study in contradiction: after all, a globe is defined as a spherical object, while a cube is anything but. But that's part of the fun - this globe is all about suspension of disbelief. Detach it from its stand and hold it in your hands. Be reminded that no matter how much we know, the world is still full of mystery.